"Despite Iceland's cruel climate, its remoteness and its winters of 19 hours of darkness per day, the people there are among the most contented in the world. 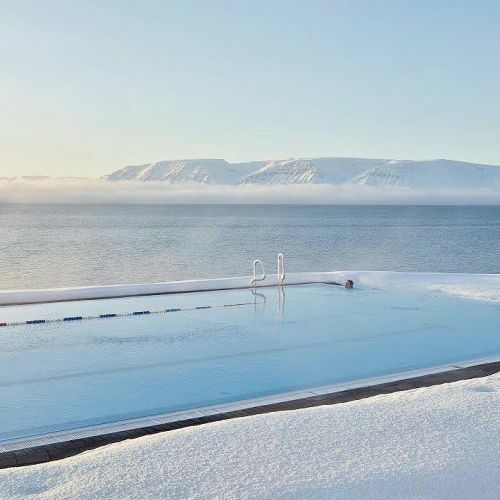 Dan Kois, contributing writer for @nytmag, has a theory for Icelanders' remarkable satisfaction: their communal pools. In a country with a population just slightly larger than that of Lexington, Kentucky, there are more than 120 public pools — usually geothermally heated, mostly outdoors, open all year long. These public pools, or sundlaugs, provide Icelanders a refuge from the fierce, freezing air and form Iceland's social space: where families meet neighbors, where newcomers first receive welcome, where rivals can't avoid one another. @massimovitali_omissamilativ photographed the pool in Hofsos, an old trading port on the northern coast of Iceland, while on assignment for @nytmag. #🏊" By nytimes on Instagram.